2018-19 Shortlisted Candidates have been announced! 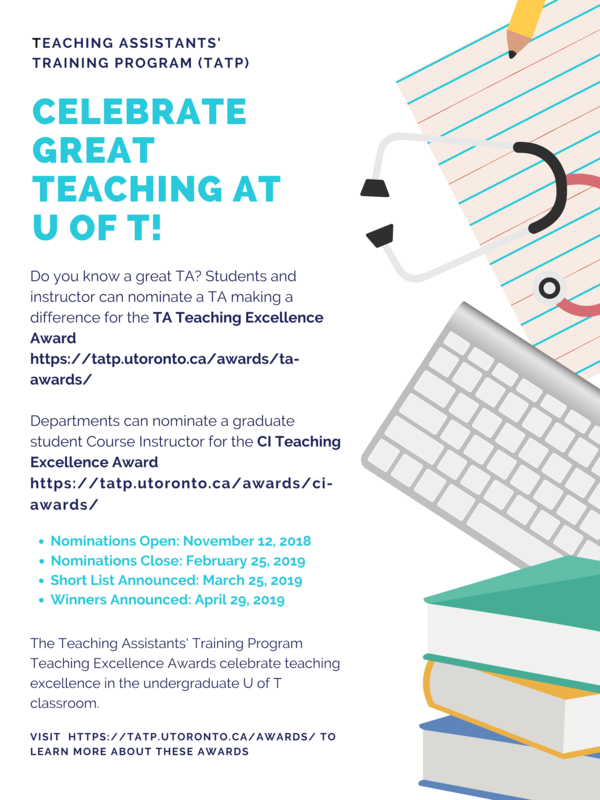 Since 2003, the Teaching Assistants’ Training Program has awarded the Teaching Excellence Award to TAs across the university. Please visit the TA Award page for information on eligibility and learn about past winners. In 2015, the TATP will launch the first-ever TATP award specifically for graduate student Course Instructors! This award will recognize one graduate student whose outstanding work as a sole-responsibility Course Instructor shows evidence of educational leadership, meaningful contributions to course and curriculum development, and impact on student learning. If you have any questions, contact natasha.ng@utoronto.ca. Please visit the UTSC awards website for a list of previous winners. Please visit the UTM website to learn more.